MIRI: Some 30,000 people from all walks of life jammed the recreational open air theatre here last night to witness Miri being proclaimed Malaysia's 10th city. Under a bright moon and starry sky, the proclamation was symbolised by the handing of an official decree from Deputy Housing and Local Government Minister Datuk Lau Hoi Chew to the state government. Sarawak Yang di-Pertua Negri Tun Abang Muhammad Salahuddin, Chief Minister Tan Sri Abdul Taib Mahmud and other state leaders were on hand to witness the historic occasion. The event was carried live over RTM 1 and radio networks. Newsmen from more than two dozen local and foreign organisations, residents from distant rural districts joined locals as well as thousands of Bruneians in the celebrations. The crowd started flooding the city by 8pm with traffic jams building up along roads leading to the proclamation site. Today, Mayor Datuk Wee Han Wen will receive his official appointment letter from the head of state at the petroleum museum here. In a telephone interview, Housing and Local Government Deputy Minister Datuk Robert Lau Hoi Chew gave Sarawak and Johor top marks for greening their urban centres. 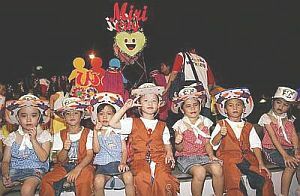 NEW ERA: Children from the Early Learning Centre kindergarten decked out in their colourful best await the countdown for Miri to be declared a city at midnight. The ministry wants to use the two states as models for the country. The ministry, in congratulating Miri on becoming Malaysia’s newest city, said it was the latest example of an urban centre in Sarawak that managed to balance material and physical infrastructure progress with environmental conservation. “The ministry hopes to see even further improvement in Miri in terms of landscaping and beautification programmes,” said Lau. He also called for more public parks and better public cleanliness, safety and security as well as services and public amenities here. Lau said the two states had generously allocated huge land banks in their urban centres for the setting up of parks, gardens and recreational facilities. His ministry would like to see all states having such a policy, he said.